Rising into mostly clear morning skies at 14:13 UTC, 7:13 a.m. local time, the 70-meter tall Falcon 9 fired its first stage for two and a half minutes before it was expended via some post-separation testing towards a soft-splashdown in the Pacific while the second stage first boosted into a preliminary orbit ahead of a circularization maneuver to dispatch Iridium-NEXT satellites 41 through 50 to their checkout orbit. SpaceX’s fairing recovery ship, “Mr Steven,” was deployed to make its second attempt at catching a Falcon 9 payload fairing half, pegged as the second major component of Falcon 9 to be advanced to an operational re-use stage. 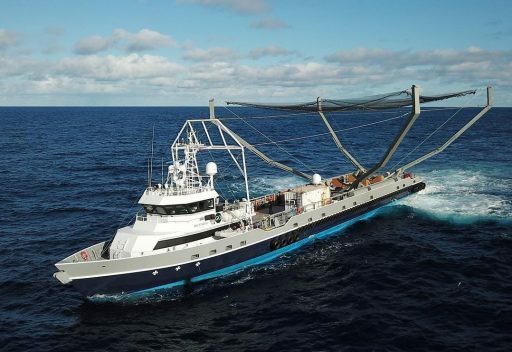 A fairing recovery attempt in February saw the fairing half chosen to be caught descend to a gentle water landing a few hundred meters from the net installed on Mr Steven and the hope was for better aim on Friday to prove the efficacy of a sea-based recovery technique. The company’s fourteenth operational Dragon mission, the second mission to re-use both the spacecraft and the rocket’s first stage, is targeting launch on Monday to begin a two-day link-up with the International Space Station. 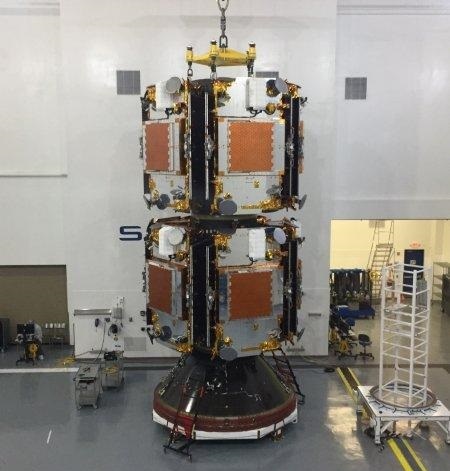 Next on the Cape Canaveral manifest is NASA’s TESS exoplanet hunter, aiming for a one-minute launch window on April 16, and after that will come the debut of SpaceX’s Falcon 9 Block 5 on the Bangabandhu-1 mission, currently looking at NET April 24. 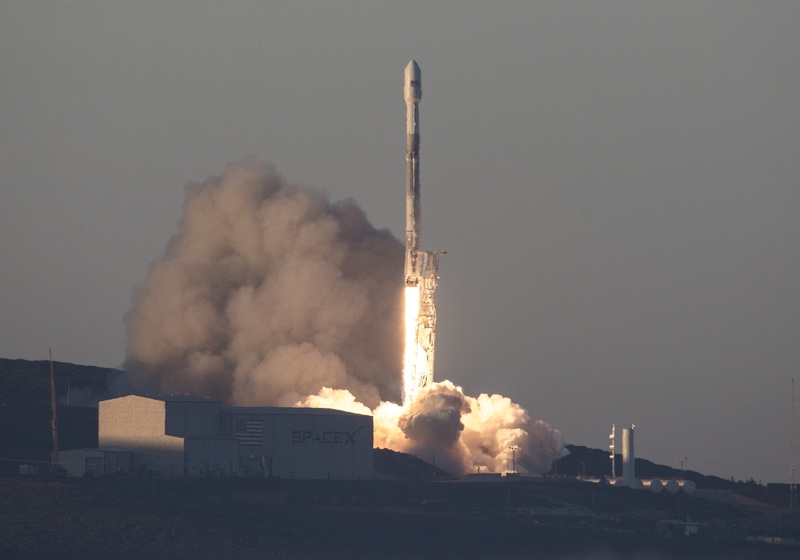 Friday’s launch was the third Falcon 9 in a row that flew its first stage in throw-away mode. Two of these missions expended their first stage by choice while one was forced to forego a Drone Ship landing due to rough seas in the designated landing area. 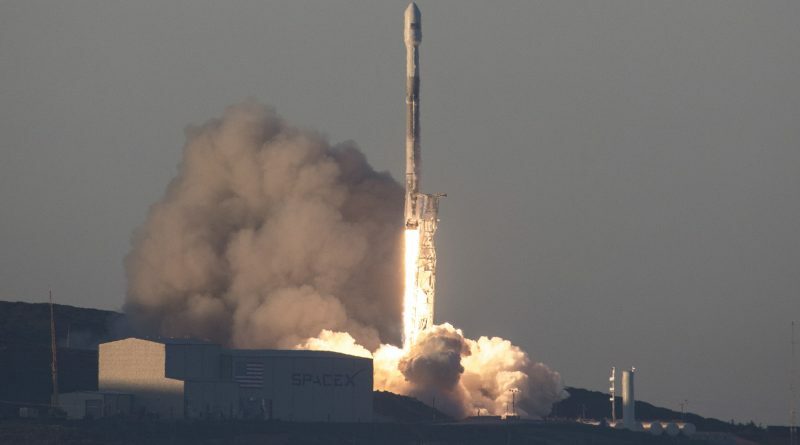 Opting against recoveries although mission performance would easily permit the stage to be recovered is a strategic move by SpaceX to dispose rockets that are not deemed suitable for more than two missions. Through expending stages that would not fly again anyway, SpaceX is making room for an upcoming flood of Block 5 first stages, ideally expected to be recovered and re-flown dozens of times. 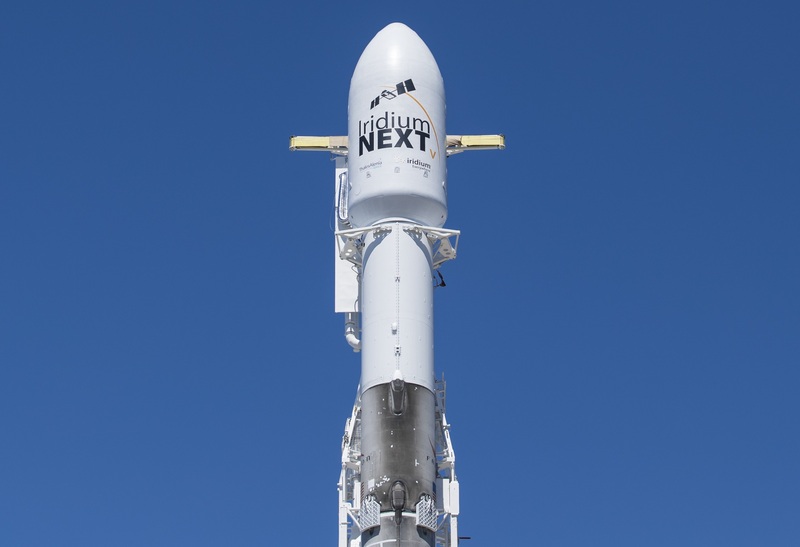 Closed up inside the nose cone of Friday’s Falcon 9 were the next ten Iridium-NEXT communications satellites – numbers 41 through 50 in what is the largest satellite constellation upgrade undertaken to date. 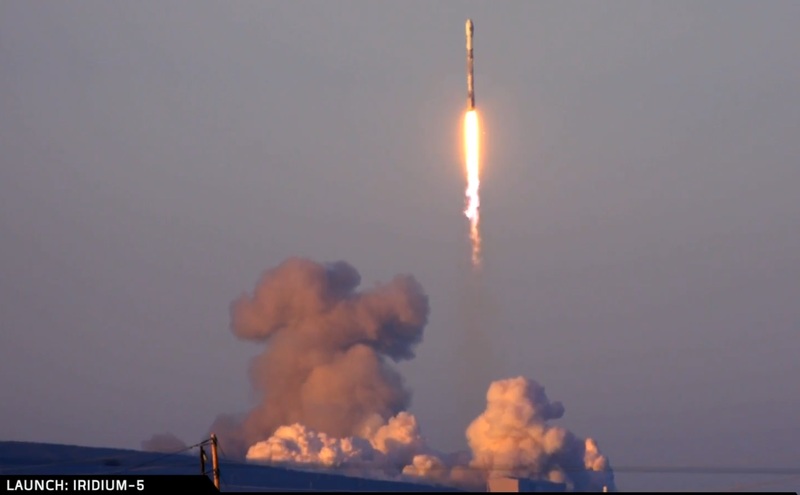 Since January 2017, SpaceX successfully delivered fifty satellites for the Virginia-based telecommunications provider – taking them to the 2/3 mark as 25 satellites remain to be launched by late summer to complete the replacement of the entire first generation constellation that has been operating since the late 1990s. 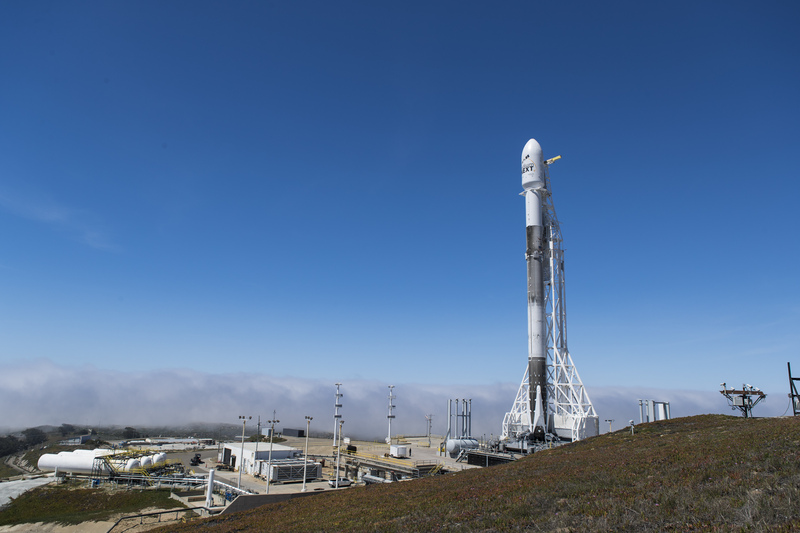 Friday’s mission was the fourth Iridium launch in nine months, not far from the original goal of launching one set every two months starting with the second mission. This launch cadence was in large part made possible by Iridium’s decision to opt for previously flown Falcon 9 vehicles since the production of new first stages had become the major bottleneck in SpaceX’s quest to step up its launch pace. Financial incentives offered by SpaceX for the initial re-use missions were not a driver for Iridium; it had all been about getting the satellites up on time. Iridium reviewed their options in 2017 and, based on the success of SpaceX’s initial re-flight missions, decided to fly on used hardware in order to keep their schedule. The original contract signed between Iridium and SpaceX had specified all eight missions to ride on new rockets — the same was the case for NASA’s Commercial Resupply Services Program which also agreed to the use of flown rockets last year. With the success of December’s mission, Iridium CEO Matt Desch recently Tweeted that Iridium-6 – the shared ride between five Iridiums and two GRACE-FO gravity observatories – would also fly on a proven vehicle. SpaceX is also feeling a change in the wind as company President Gwynne Shotwell recently noted that 2018 would be the first year that SpaceX will be waiting for their customers to have satellites ready for launch after it had been the other way around for the last five years. Up to 30 missions are on SpaceX’s manifest for 2018, another large step forward after a record-setting 2017 with 18 Falcon 9 missions. Iridium put all their eggs into one basket when selecting SpaceX back in 2010 for the launch of the entire Iridium-NEXT fleet – at the time the largest commercial launch contract ever awarded with a total value of $492 million for seven Falcon 9 rockets. 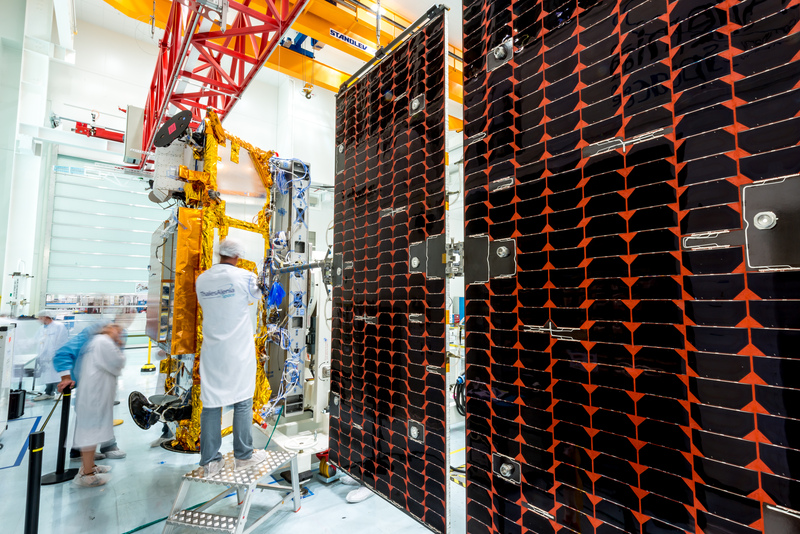 81 Iridium-NEXT satellites were ordered from Europe’s Thales Alenia and Orbital ATK was selected for the integration under an assembly-line architecture at the company’s Gilbert, Arizona facility. 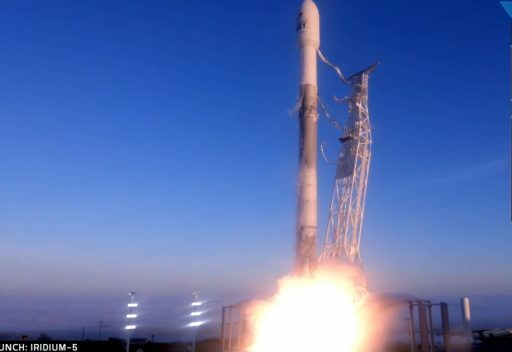 An eighth Falcon 9 launch was procured under a shared agreement with the U.S.-German GRACE mission to loft a total of 75 NEXT satellites, enough to fill all 66 constellation slots and pre-position nine spares to go into service at a moment’s notice while six more satellites could be stored on the ground to replenish the constellation when needed. 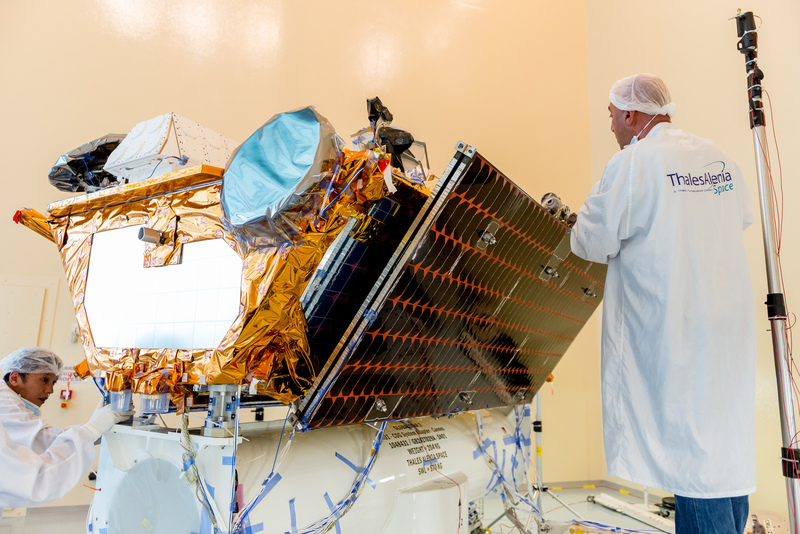 All in all, replacing the entire first-generation Iridium constellation came with a price tag in excess of $3 billion – covering satellite manufacture, launch services and ground segment enhancements. Iridium functions by carefully spacing its satellites in six orbital planes in a near-polar orbit to ensure at least one satellite is visible from any location of Earth at any given time. Inter-satellite links and a state-of-the-art ground system then route communications packages from one terminal to a destination point that can be located anywhere on Earth – creating the only true global communications architecture currently in operation. 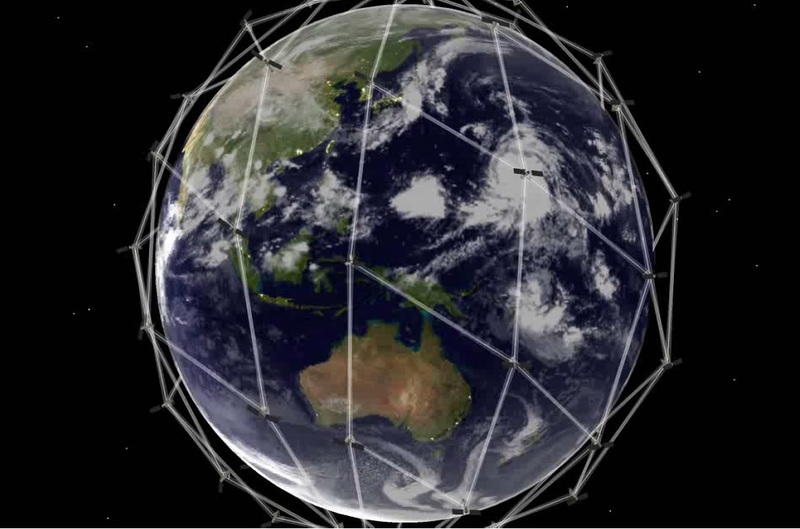 Iridium operates eleven active satellites in each orbital plane, flying 780 Kilometers in altitude at an inclination of 88° to create pole-to-pole coverage. 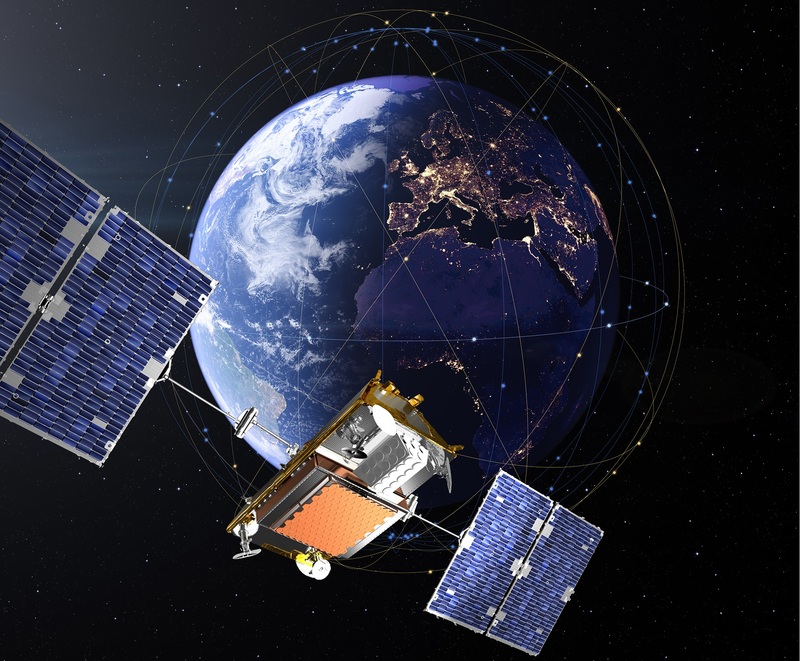 Nearly one million customers use Iridium’s network, ranging from personal satellite phones, over sea-going terminals to Low-Earth Orbit satellites. 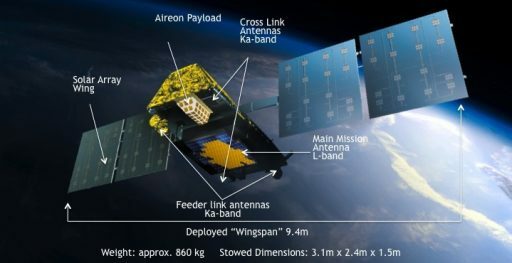 Each member of the constellation weighs 860 Kilograms at launch and hosts a powerful communications terminal covering a 4,700-Kilometer footprint on the ground with its L-Band phased array antenna while the cross-link between neighboring satellites is handled through powerful Ka-Band links. 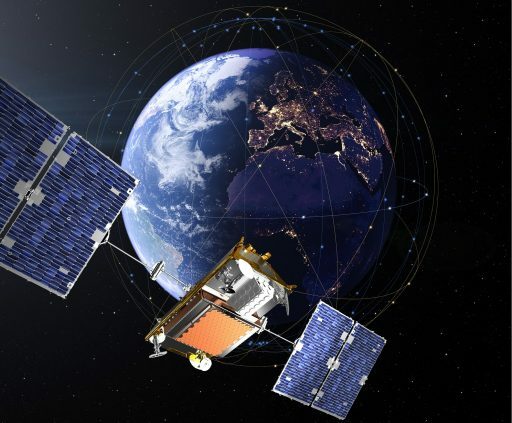 Services provided by Iridium-NEXT range from telephony over short-burst data delivery all the way to newly introduced high-capacity services with data speeds up to 8 Mbit/s realized via Ka-Band up/downlinks not possible with the heritage constellation. With the upgrade to the Iridium-NEXT constellation, the company also explores new business areas as the NEXT satellites host terminals to receive Automatic Identification System messages for real-time ship-tracking across the globe and hosted payloads for commercial company Aireon capture ADS-B transmissions from commercial aircraft to offer global air tracking services on the commercial market. Iridium CEO Matt Desch noted that the company continues on track to finish launching Iridium-NEXT satellites by late summer which should enable all constellation slots to be filled with upgraded satellites by the end of the third quarter. The company is keeping some of the older satellites in standby until the upgraded constellation is finalized and spares are positioned in every plane at which point the last of the remaining first generation satellites will be de-boosted – also putting an end to the well-known Iridium flares that have dazzled observers on the ground for the last two decades. Gearing up for the Iridium-5 mission, Falcon 9 fired up its first stage at sunrise on March 25th for the customary Static Fire Test that is of additional importance for re-use missions since Falcon 9 boosters do not go through a complete re-acceptance test cycle after refurbishment. With a clean vehicle, teams were proceeding into integration of the payload; however, a faulty ground harness cable forced the mission to move from Thursday to Friday due to the time consumed for troubleshooting. 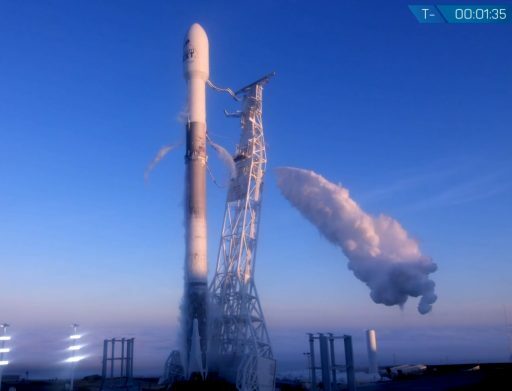 Falcon 9 was raised to its vertical position atop Space Launch Complex 4E on Thursday and entered an overnight countdown operation for a detailed set of checkouts before computers were handed control at the T-70-minute mark for propellant loading. A new day dawned upon Vandenberg just as Falcon 9 began its expedited tanking sequence, receiving some 155 metric tons of chilled Rocket Propellant 1 from T-70 minutes and loading up on ~360 metric tons of sub-cooled Liquid Oxygen from T-35 minutes. Propellants were still flowing into the two-stage rocket when the fast-paced final countdown events got underway at T-7 minutes to condition the nine Merlin 1D engines for ignition, exercise the rocket’s fuel valves and actuators one last time, retract the Strongback structure and arm the Autonomous Flight Termination System. The completion of fueling was called out at T-2 minutes and Falcon 9 became fully autonomous when its flight computers assumed control at T-1 minute. The green flash of Falcon’s igniter mixture erupted from the engines at T-3 seconds as all nine were commanded to fire-up and throttle to a collective thrust of nearly 700 metric tons for liftoff at precisely 14:13:51 UTC, the optimized launch time for Plane #1 of the Iridium constellation. Shooting into clear morning skies, Falcon 9 climbed vertically for less than 15 seconds before pitching onto a trajectory taking it due south and out over the Pacific. Falcon 9 consumed 2,500 Kilograms of propellant per second as its engines pushed the vehicle through the speed of sound at T+65 seconds followed around eleven seconds later by Maximum Dynamic Pressure for which the engines were throttled back briefly to reduce stress on the rocket’s structure. 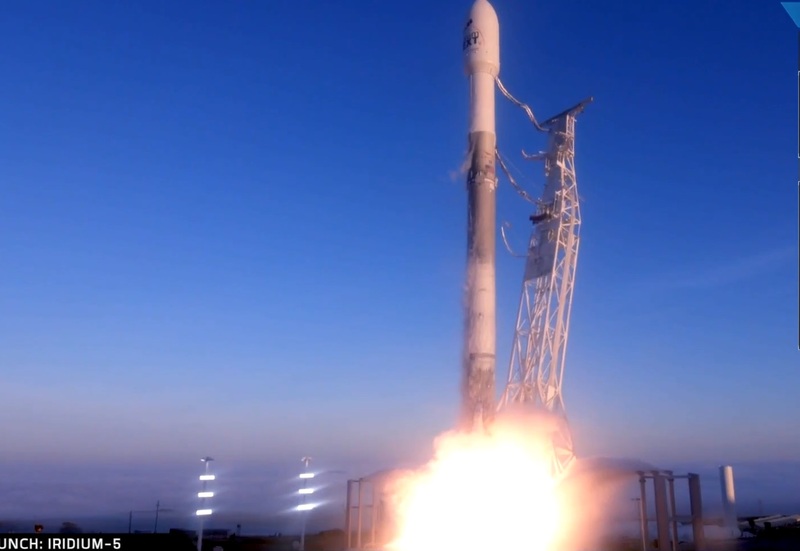 The first stage boosted Falcon 9 to a speed of 2.11 Kilometer per second, shutting down its engines two minutes and 33 seconds after launch. Four pneumatic pushers sent the two stages of the rocket on their separate ways three seconds later as the vehicle passed 69 Kilometers in altitude. From there, it was up to the MVac-powered second stage to first lift the stack into a preliminary Parking Orbit and then carry out a critical circularization maneuver before sending the ten satellites off into orbit. The first stage, although eventually headed to a watery grave in the Pacific, was tasked with a series of return maneuvers to use its remaining life for a data-gathering exercise in a bid to study different return profiles to further cut propellant margins for future Falcon 9 recovery missions. Immediately after separation, the 47-meter long booster used its nitrogen thrusters to flip around for a single-engine boostback maneuver. This 18-second partial boost back was designed to limit the rocket’s downrange travel distance – aiming for the northern half of a 325-Kilometer long and 140-Kilometer wide box centered some 565 Kilometers from the launch pad. SpaceX’s NRC Quest support ship was dispatched to the northern half of the downrange safety box to observe the splashdown and, more importantly, capture telemetry from the descending vehicle as the atmospheric flight portion was of greatest relevance. Mr Steven, the fairing recovery vessel, was tracked in the southern half of the box, waiting to receive one of the fairing halves. Stage 1 was expected to conduct a brief Entry Burn around T+7 minutes to lessen the aerodynamic loads experienced upon re-entry. The vehicle’s four actuated grid fins were then charged with maneuvering it toward its landing point – setting the appropriate angle of attack and correcting any trajectory errors ahead of a landing burn designed to bring the vehicle to a gentle touchdown in the Pacific Ocean. Continuing the morning’s primary mission, Falcon’s second stage fired up its 95,000-Kilogram-force engine two minutes and 45 seconds into the flight, setting its sights on an elliptical transfer orbit. 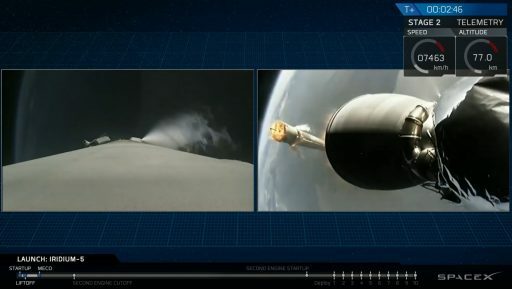 By T+3 minutes and 26 seconds, the vehicle passed 110 Kilometers in altitude and pushed open its two payload fairing halves which then rotated outward and away from the second stage, en-route to another attempt at refining SpaceX’s fairing recovery process. Fairing 2.0 – debuting earlier this year – hosts a number of upgrades to make the fairing easier and cheaper to manufacture while also introducing a series of recovery systems. From an external appearance, the upgraded fairing seems to be slightly larger than its predecessor, growing around 0.1 meter in diameter and length, but what differentiates it from the baseline Falcon fairing resides on the inside and at the fairing base in the form of an upgraded structural interface. Each fairing half has its own avionics system, pressure vessels holding Nitrogen gas, a manifold of lines transporting propellant to a series of cold gas thrusters and a compartment for an auto-steering parachute. As the fairings separate from the ascending rocket, they are to employ their thrusters to stabilize from their initial tumble and enter a pre-determined orientation for atmospheric re-entry. The auto-steering chute will then be tasked with guiding each fairing half toward a recovery boat positioned to ‘catch’ it. Whether Mr. Steven was successful on its quest on Friday has not been revealed immediately after the day’s launch. While the fairing slowly descended back to Earth, Falcon’s second stage successfully reached orbit – shutting down right at the T+9-minute mark and transitioning to 43 minutes of passive coasting in order to climb to the high point of its elliptical Parking Orbit for the critical circularization burn. SpaceX ended live coverage of the mission after the initial Parking Orbit insertion, citing a restriction imposed by the National Oceanic and Atmospheric Administration (NOAA) that prevented the company from continuing to broadcasting imagery from the second stage’s onboard camera. NOAA spokespeople were not aware of a restriction related to the Iridium-5 mission and were looking into the matter. Crossing Antarctica, the second stage entered a northerly leg, approaching the island of Madagascar when re-lighting its MVac engine at T+52 minutes and five seconds on a brief burn to speed up by 125 meters per second and lift the orbit’s perigee altitude. Mission Control confirmed a nominal orbit was achieved and the second stage entered the carefully planned release sequence at T+57 minutes to send one Iridium satellite off into orbit every 110 seconds. In the hours after launch, the ten new additions to the Iridium constellation will spread their wings by deploying their power-generating solar arrays, complete initial health checks and begin communicating with ground stations to head into commissioning. All ten satellites of the Iridium-5 mission will move into operational slots within the first orbital plane, requiring no lengthy drifting.